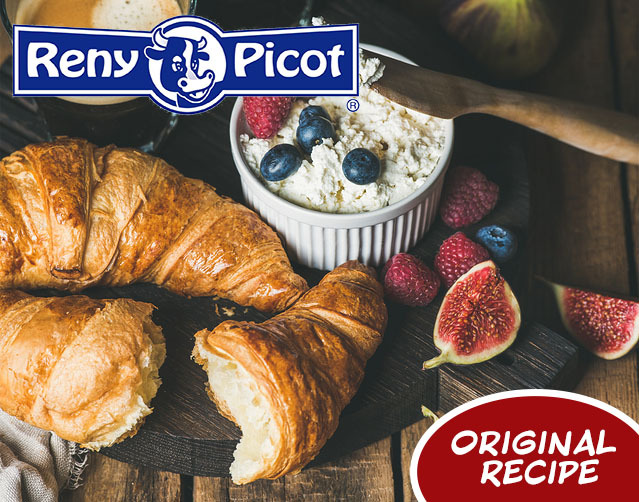 The combination of honey-glazed figs tucked into a buttery puff pastry blanket with the fruity, tangy notes of Reny Picot Camembert creates a fun hors d’oeuvre with a beautifully sophisticated flavor profile. But the best thing about this spectacular nibble is how easy it is to prepare and that it can all be done in advance. Preheat oven to 400°F and line two baking sheets with parchment. Stir vinegar, honey, and 3/4 cup water in a pot. Add figs and bring to a boil. Reduce heat and simmer, stirring occasionally, until figs are soft and liquid is a syrupy consistency (about 5–10 minutes). Transfer figs to a plate to cool and set aside. Beat egg with 1 tablespoon of water in a small bowl to create an egg wash. Roll each sheet of puff pastry into an 12×9 inch rectangle on a lightly floured surface. Cut pastry along the 12-inch side into 12 even strips. Cut each strip crosswise into pieces about 4 1/2-inches long. Scoop a small teaspoon of Reny Picot Camembert and press into cut side of a fig half. Place stuffed fig half in the center of a pastry strip. Brush one end of pastry with egg wash and roll to enclose. Transfer seam side down to baking sheet. Repeat with remaining ingredients and brush top of each pastry with egg wash.
Bake 15-18 minutes or until golden brown and puffed.